Freestyle skiing is both amazing and spellbinding. Viewers feel their hearts stop as the skier flies high off the jump, does a somersault and then flies away down the slope in a snowy whirlwind. At times, it seems like only the luckiest ones survive to take part in competitions. Russkiy Reporter’s Sonya Bekina talked about the sport with Dmitry Kavunov, the Russian national team’s senior coach for aerial skiing. Aerial skiing is not just the most entertaining of all the freestyle disciplines, it’s also the most “ancient.” Ski ballet competitions were held for the first time back in the 1920s—although then the athletes slid down a gentle slope accompanied by music, combining jumps and twists with a smooth downhill glide. Today, aerial skiing is both amazing and spellbinding. Viewers feel their hearts stop as the skier flies high off the jump, does a somersault and then flies away down the slope in a snowy whirlwind. Russkiy Reporter’s Sonya Bekina talked about the sport with Dmitry Kavunov, the Russian national team’s senior coach for aerial skiing. Russkiy Reporter: Tell me how a trick is learned. Dmitry Kavunov: Preparation takes a lot of time. We have a certain process: First, people learn how to do a somersault on the carpet and then on the trampoline. Then we see how well they can ski. If everything works out, we put them on water. After they pull it off on water, we move them to the snow. R.R. 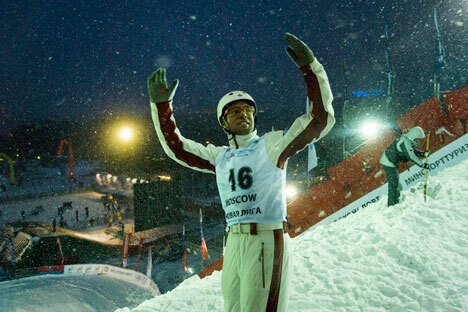 : How do you view Russia’s place in global freestyle skiing? D.K. : In terms of aerial skiing in the future, I see it as being dominant. Russia should be one of the leading countries in this type of sport because it has everything for it. Mogul skiing is also on a high level here: Some of the guys have taken fourth and fifth place at the World Cup. They are on the verge of being elite skiers. R.R. : Is it possible to talk about some sort of Russian school of skiing, a certain style of skiing and training that differs, say, from an American style? D.K. : It would have been possible to talk about this in the past, back in Soviet times when we started. But now we use the same styles and training methods, we share expertise with one another. R.R. : Freestyle skiing isn’t a major sport, and the lack of attention leads to a lack of financing. Do you have such problems? D.K. : I don’t think it’s a matter of financing. It’s more an issue of the sport itself. Freestyle is so multifaceted and complex – you have to know how to ski and be an acrobat. In addition, it’s a very “specialized” type of sport that not everyone can do. For example, everyone can play soccer, then somebody makes it to a higher level, while another person doesn’t, but the first will still continue to play soccer for himself. With freestyle, you can’t just go and jump on skis ten meters in the air. If you’re doing it, that means it’s a sport, it’s serious, it’s preparation. Thus, there aren’t a lot of takers in principle, and there’s enough to go around for everyone. R.R. : And does Russia have everything for it? D.K. : I think so. In Russia, there are boatloads of opportunities because the country itself is so big. There are huge human resources, lots of snow and schools, and what’s really important is they are free schools! I worked in the United States and Canada for 10 years and everything costs money there. Most of the schools for early sport, acrobatics and freestyle remain free in Russia to this day. Some guys came to visit us from Ufa and Yaroslavl, for example, and they don’t pay for freestyle school. And I’m not just talking about acrobatics, but mogul skiing as well. R.R. : How many people are on your national team? D.K. : There are six of them this year. Unfortunately, they’re all boys. We have two girls, but it’s still too early for them to go to the World Cup. They haven’t quite reached that level. R.R. : Many people probably think that the earlier they start performing at that level, the easier it will be later. D.K. : If you’re ready, then sure. If an athlete has a decent program but no experience, then of course. But they would’ve come to a global competition, first of all, with a very light prograM and, secondly, unprepared. They fall once, get up once, then fall three times. They need to train. You don’t learn a program at the World Cup, you tinker with it there. R.R. : Where does the national team train? D.K. : The senior national team trained in the United States, because the World Cup stages were being held in Canada and America. The second string team trained in Finland while we were in America. R.R. : Is it impossible to train in Russia? Are the conditions not right? D.K. : No, particularly in the early stages. After all, we start training in November and there should already be snow at the base, which we don’t have. It’s easier to find a base in, say, January or February, but that’s competition time and we have to perform. So it turns out that the main team has no opportunity to train in Russia. R.R. : Will you move to Krasnaya Polyana when it’s ready? D.K. : When it’s ready, of course. We’re hosting the Olympics, so why not prepare for them at home? When you train on the same slope where the competition is going to be held, you get used to the weather, the conditions and all the nuances. Having your own slope means a lot.